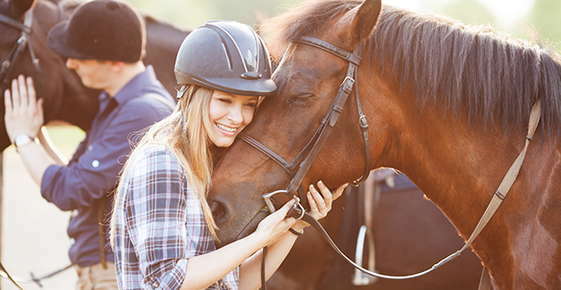 Horse owners form a special bond with their horses, but this close connection comes with the responsibility of caring for your equine companion throughout its life. This means taking care of your horse every day throughout the year, come rain or shine. If you do this well, your horse can live up to 35 years. To help you repay your horse for all that it provides, here are some tips on proper horse care. A horse’s digestive system is built to handle large amounts of grass, so the main diet for your horse should be grass, along with hay that is free of mold and dust. Your horse should also always have access to fresh, clean water (and don’t let it freeze in winter). However, grains are high in carbohydrates, which many horses don’t need. “High energy” diets may also cause other health problems in foals and adult horses. For these reasons, ask your equine veterinarian if you should feed your horse grain. Vaccinations and regular deworming are important parts of your horse’s health. Your veterinarian can provide you with the proper schedule for these. In addition to the tetanus vaccine, horses are routinely given vaccines for equine encephalomyelitis (eastern and western), equine herpes (rhinopneumonitis), equine influenza and rabies. In addition, deworming can rid your horse of worms that can cause poor coat, colic and weight loss. You can reduce your horse’s risk of picking up parasites like this by giving horses enough land to graze on, rotating pastures (if possible) and regularly cleaning up feces. Horses are social animals, so it’s important to provide your horse with opportunities to interact outside with other horses, every day if possible. Although horse may be able to sleep lightly while standing (with their legs “locked”), they need to lie down for deep sleep. Horses also require daily exercise to strengthen their muscles, lungs and heart. If you are training your horse, increase the intensity gradually. Unless it is very windy and wet, horses are better at tolerating cold than heat and humidity. When it is hot and humid, use caution when exercising your horse. In extreme heat and humidity, let your horse rest in the shade. Horses’ hooves should be trimmed regularly — every six to eight weeks if the hoof doesn’t get enough natural wear. Your horse may not require horseshoes, especially if the hooves are allowed to strengthen naturally. Talk to your equine veterinarian or farrier about keeping your horse’s hooves healthy. A horse’s teeth are always growing. If they are worn down unevenly, the teeth may develop sharp edges and points that can be painful or make it hard for your horse to chew. You should have your horse’s teeth checked once or twice each year. If dental problems are not treated, they can lead to colic, choking or weight loss. If you have any questions about caring for your horse, speak to your equine veterinarian. Our office is happy to help!